WOLVERHAMPTON clung on for a marginal 45-44 victory over a tenacious Leicester side that belied the club's winter troubles. The 2016 Elite League champions found themselves behind after nine of the 15 heats in a tense tussle at Monmore Green before leading lights Freddie Lindgren and Sam Masters saved the day. Wolves trailed by three going into heat 13 but the dynamic duo flew out of the traps and produced the team ride of the night to swing the pendulum. It was still not plain sailing for the hosts but a pair of shared races saw Peter Adams’s side hold out for a hard-fought three points in the end. “We didn’t underestimate Leicester, that’s for certain,” said team boss Adams. “They have a good, solid team and Kim Nilsson went very well but it was closer than we would have liked, for sure. “Of course, we were disappointed with the performance of our reserves. Effectively, we were trying to win a match with five scoring riders and that will be a situation for us to monitor as the season unfolds. “I don’t think any of the riders have hit top form yet but the top five are doing enough to keep us in matches. The reserves are a concern. Wolves will get the chance to hone their home performances in a challenge fixture against Coventry Bees at Monmore Green next Monday (7.30). WOLVERHAMPTON 45: Freddie Lindgren 11+2, Sam Masters 10+1, Jacob Thorssell 10, Kyle Howarth 8+1, Adam Skornicki 3+2, Max Clegg 2+1, Nathan Greaves 1. 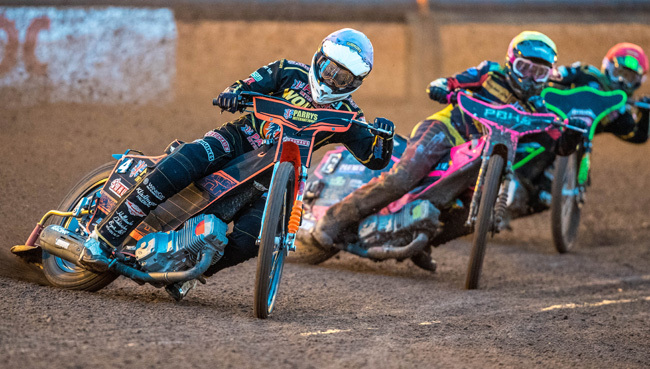 LEICESTER 44: Kim Nilsson 12, Josh Bates 8+1, Kacper Gomolski 6+2, Erik Riss 6, Danny King 5, Danny Ayres 4+3, Josh Auty 3.